A backless stool that is expertly crafted, the Whitworth Drafting Stool with Wood Seat is sure to make a distinct statement in any setting. It offers a high-quality metal frame with a wood seat, combining fashion and function perfectly. Plus, the stool features a swivel seat that is easy to adjust and represents a great choice in a residential or home setting. 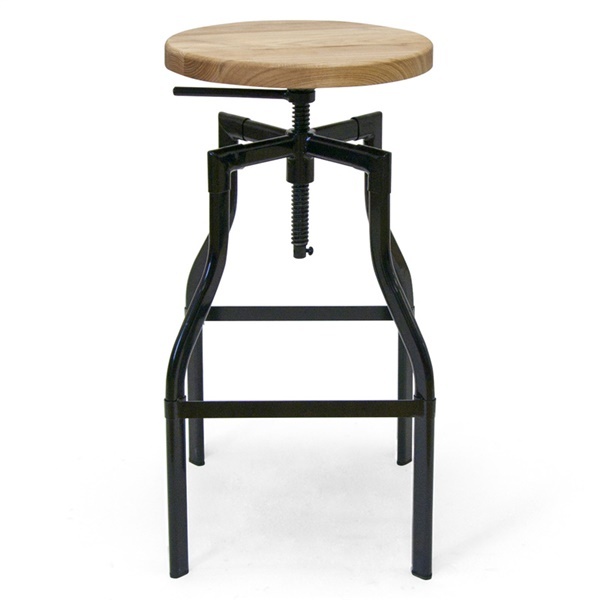 Pick up a stool that is both stylish and comfortable with the Whitworth Drafting Stool with Wood Seat. Backless design makes it simple to store the stool under a table. Swivel seat is easy to adjust. Sturdy metal frame with wood seat delivers long-lasting quality. Crafted for residential or commercial use. I ordered these, my husband put them together (really easy to do) and tore up the boxes without having sat in them. This was a huge mistake. These stools are terribly uncomfortable. The wood seat itself seems too big and causes your legs to be in a difficult position to have your feet reach the bottom where should rest on the foot bar and the foot bar is very uncomfortable for your feet if you do not have shoes on. Really a great price but you get what you pay for with these. However I will say that I have ordered other stools from inmod and loved them, I do not recommend ordering these though. I wish we still had the boxes and could send them back to order a differentt stool. put my mind at ease and brought new life to my kitchen! Was up in the air between these and the whitworth drafting stool which is entirely in metal and silver. Most of my kitchen appliances and accents are metallic silver but I thought throwing a different material like wood and metal in a darker finish would take the design from basic to expert - TOTALLY did! Give something new a try, this purchase actually squashed any fear of going wrong specifically when it comes to interior design! Fast shipping, pretty unbelievable pricing for the quality and great customer support - I felt like i was talking to a team of interior designers when i called for suggestions, i don't usually write reviews but as a first timer here i was impressed enough to want to leave some feedback and show my appreciation - thank you! Swivel function was a real plus! Ultra durable and sturdy design - hoping they last a long time! Good looking stools, nice quality and make - price was incredibly affordable and well worth it, they look amazing!! EXACTLY what I wanted!! They look awesome and they came quickly and perfectly. One of the easiest furniture shopping experiences online i've EVER had! industrial with a little rustic charm to it. Surprisingly comfortable! Items arrived in a timely manner, customer service was excellent. Happy to have a pair of these at my personal bar at home, thanks. How many pounds can the stool support? This still is rated for commercial use and it is rated for up to 250 lbs. could you tell me if there are foot rests or cross braces on all four sides or are there only two? We have confirmed that the foot rests / cross bars are present on all 4 sides of the stool.